Multi-compartments make life easier. lift off the lid and voila: food. no more messing with baggies or multiple containers. Recycleable. Goodbyn products are built to last. But when you?re done, they are completely recycleable. 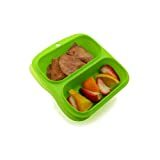 Goodbyn Small Meal is a food container designed with two 1-1/4-cup compartments to keep food separated while you’re on-the-go. Better yet, it has a designated spot for the Goodbyn leak-proof Dipper, to store dressings, hummus, or yogurt (sold separately). Made entirely of FDA-approved materials, no BPAs or phthalates and lead-safe, Goodbyn Small Meal is dishwasher-safe and made to last. And when it’s time for a new one, Goodbyn Small Meal is 100 percent recyclable. Goodbyn Small Meal does away with wasteful plastic bags. You can save an estimated 0 per child each year on eliminating plastic bags and drink boxes. More reasons to love your lunch without breaking the bank. Designed for versatility. Available in four awesome colors, Snacks stacks, nests, and travels well with the entire Goodbyn Ecosystem. Additional product sizes available for snacks, salads, sandwiches, hydration, ice packs, insulated bags, and dishwasher-safe stickers… all designed to work together. Goodbyn products are not guaranteed to be leakproof. Accessories sold separately.